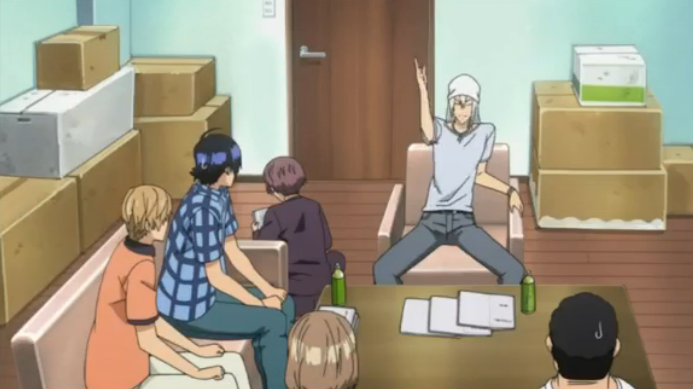 Bakuman 22 – what was the point of this exercise? In episode 22, everyone gets together -- for no particular reason. Bakuman is heading towards its climax, which looks like it will be the battle for the Golden Future Cup. I can’t say I love this show, but I am attracted to some aspects of it. On occasion, it has captured the intensity and drive that a good shounen story should present. The drive to be #1 at something is the core of the generic shounen story, and Bakuman manages to present that struggle in a novel arena — the world of professional manga artists. On the other hand, there is something thin about both the story and the presentation. I won’t dwell on the disappointing visuals, except to say that I find it ironic that a show that is in part about the art of illustration should be so flat, awkward, and generally uninteresting to look at. The story itself has also fallen flat at times. What follows is my reaction to what (did not) happen in episode 22. Last episode introduced the final two contenders who will be competing with Ashirogi Muto (that is, our heroes) for the Golden Future Cup. Both turn out to be obnoxious, which is a good thing in an opponent. After all, you want to feel really good about stomping them. So far so good, right? No. Several of the aspiring mangaka go to the editorial office to complain about one of the contenders who is arguably cheating, by using his fame as a pop idol to get votes. Now this is kind of lame; complaining is not a shounen virtue. Fortunately the editors refuse to acknowledge their claim, and the GFC contenders decide they will fight with their manga. So the first half was almost a waste, except that everyone decided to meet up for a critique session of each other’s entries. They read each other’s stories and decide not to critique them. Wha? The critique session a few episodes back was one of the better incorporations of a professional mangaka activity into the storyline. It made decent sense here, as it could be seen as the rough equivalent to one of those grueling training sessions that always precede a title bout in Hajime no Ippo. Getting critical feedback on your work is an excellent way to learn, and to improve. Instead, we have all the setup, and then it is dropped. They all go home. What we’re left with is animation of Miho singing. This is exactly the sort of thing that could be cut to make room for the core of the story. Instead the story turned out to be … what? What actually happened? They didn’t truly challenge the editorial staff, because they backed down. They didn’t work on their mangas, because they abandoned the critique session. In the end, it appears the important plot point was that Miho texted Saiko to “Fight”. Now Saiko says he will rewrite the story, but it would make more sense to make changes after having gotten feedback from the other artists. We are left with nothing but mysticism; it is as if one can simply write a story anew and guarantee it will improve. This episode did leave me somewhat disappointed, but I wouldn’t say Bakuman is utterly terrible. I really don’t read manga, otherwise I would definitely check out the source. I can’t shake the feeling that good source material was squandered by JC Staff, who perhaps underfunded the project, and/or put their B-team in charge. This is quite the frustrating show isn’t it? I thought getting the director for Honey & Clover was going to be good for the show – even though it was maybe an odd choice for a shounen manga, I thought the comedic timing in H&C was fantastic, that’s been totally missing from this show. It’s neither funny, nor dramatic. Honestly, it’s really quite a disaster. Given that JC Staff has done some excellent work in the past (H&C was, if anything, too good), and given that the source material was so well received, I suppose “disaster” is a fair assessment. I didn’t talk too much about the poor visuals, but the one thing you usually can count on JC Staff for is that the show will look pretty. How did it come to this?